Please provide us with the valid commercial address. The item can only be delivered where the truck can park. (NOT INCLUDED in our product). The best way to describe how this lasers work is to compare it to your printer. This devise uses the images you would typically print on paper, but instead, a CO2 laser beam is fired on the surface which engraves the design on the material. 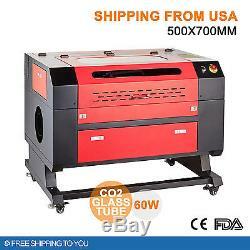 Laser: CO2 laser source, 60 watts. Engraving Materials: Wood, cork, veneer, rubber, jade, acrylic, plastic, glass, fiberglass, marble, corian, leather, fabric, cloth, coated metals, aluminum oxide, ceramics, tile, mylar, delrin, melamine, paper, pressboard, matte board and more. Cutting Materials: Wood, acrylic, plastic, corian, delrin, cloth, leather, melamine, paper, pressboard, matte board, mylar, rubber, veneer, cork and more. We strive to provide the best image quality, speed, reliability, and ease of use. By using only the highest-quality components, our lasers are known for their reliability and performance. No additional, expensive lens packages needed to get the highest resolution engraving thanks to our Radiance Optics. 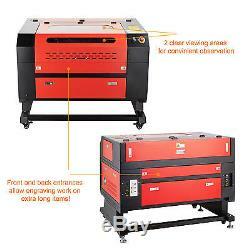 Provides a visible laser beam to determine exactly where the laser will fire. Designed to last for a long time without wobbling, failure and replacement of the plastic bearings. Precision drive belts are made from the sturdiest, belt (x-axis) and steel cord (y-axis). Front and back drop-down doors for easy access. You can open the two doors to accommodate larger material. 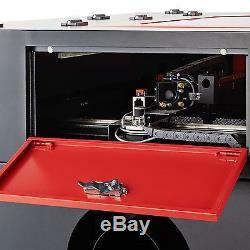 Easily access the back of your machine for cleaning and maintenance. Provides the best operator safety features available. Easily map different speed and power settings to create different colors in your file. 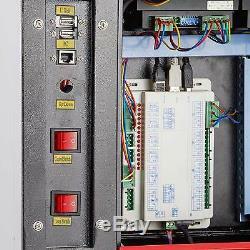 Its DSP Control System works with most graphics design programs, such as CorelDraw, AutoCAD, etc. This software allows you to create same shape patterns with different colors. Network the Laser Across Your Business. Communicates with your laser through Ethernet or USB. Blows a constant stream of air on the cutting area. 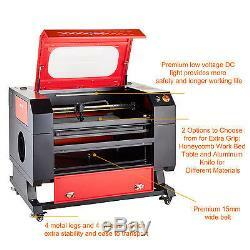 The adjustable table can easily be moved up and down to fit a wide variety of engraving materials and products. 28" x 20"700 x 500. Digitally controlled CO2 laser tubes are fully. Permanently aligned and field replaceable. Attach an air compressor to our included Air Assist toremove excess heat and combustible gases from the cutting surface by directing a constant stream of compressed air across the cutting surface. RDWorks V8, PowerCut, CorelDraw or AutoCAD. Our product is fully compatible with compatible with Core Laser, RDworksV8 & CAD Laser, but none of these software is included in the package. Since the laser beam is invisible, a Red Dot Pointer on the Fusion Laser allows you to have a visual reference for locating where the laser will fire. Ground and polished stainless steel long-lasting bearing system. Vector color mapping links speed, power and focus to any RGB. Size (W x D x H). 45" x 33.8" x 38(1150 x 860 x 970 mm). 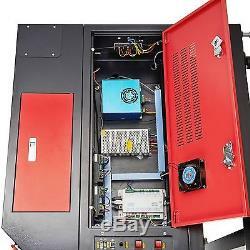 An Air Compressor can work with the included Air Assist features of the laser systems. Direct a constant stream of air to your cutting surface to remove heat and combustible gases from the work area. 4 pin connector Rotation axis is NOT INCLUDED. Metals with plating can NOT be engraved or cut. CO2 lasers will mark bare metals when coated with a metal marking solution. 1x bag with allen wrenches. 1x roll of double faced tape. How tall is this product? What's the height of the base? What software is this engraver compatible with? 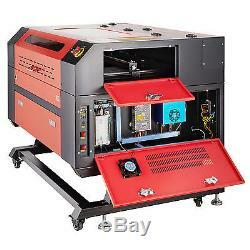 What systems is this engraver compatible with? It's perfectly compatible with Windows 8, 7 (64/32 bit), XP, 2000, but NOT compatible with iOS system. Is there any limitation for the maximal depth of engraving materials? 28" x 20" /700 x 500 mm. What's the maximal engraving depth of this engraver? It shall be within 0-8mm, but still depends on the speed and materials. How much is the laser power? CO2 glass 60W rated an estimated 2,500 - 3,000 hours. 8 hours' work-time a day is recommended and you'd better let the engraver rest for half an hour each 4 hours. Is there any limitation on the material thickness? 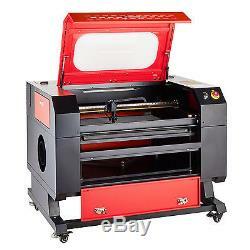 The maximum engraving material thickness shall be 230mm. What engraving materials can this engraver work with? Wood, cork, veneer, rubber, jade, acrylic, plastic, glass, fiberglass, marble. Corian, leather, fabric, cloth, coated metals, anodized aluminum, ceramics, tile, mylar, delrin, melamine, paper, pressboard, matte board and more. No but you can install one. How long is the laser tube? Is there a red dot pointer in the engraver? How much is the engraver's. Is there a water chiller in it? Is the laser safe to operate? Yes, the laser is completely safe to operate. It is secured with interlock devices so it will not run with the devise door open. Can the laser engrave metal? Our CO2 laser systems are mainly designed to engrave and cut non-metallic materials, they can also be used to mark on metal with the aid of metal-marking compound. 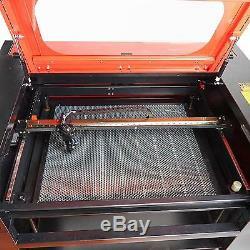 Can the laser cut through metal? At the bottom of this page.. We're happy to help you with anything! 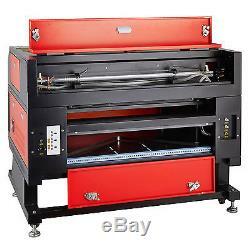 The item "60W 500x700mm Co2 USB Laser Engraving Cutter Stand Cutting Machine Engraver" is in sale since Sunday, March 13, 2016. This item is in the category "Business & Industrial\Printing & Graphic Arts\Screen & Specialty Printing\Engraving". 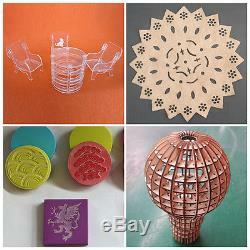 The seller is "freeshipping2you" and is located in Anaheim, California. This item can be shipped to United States.